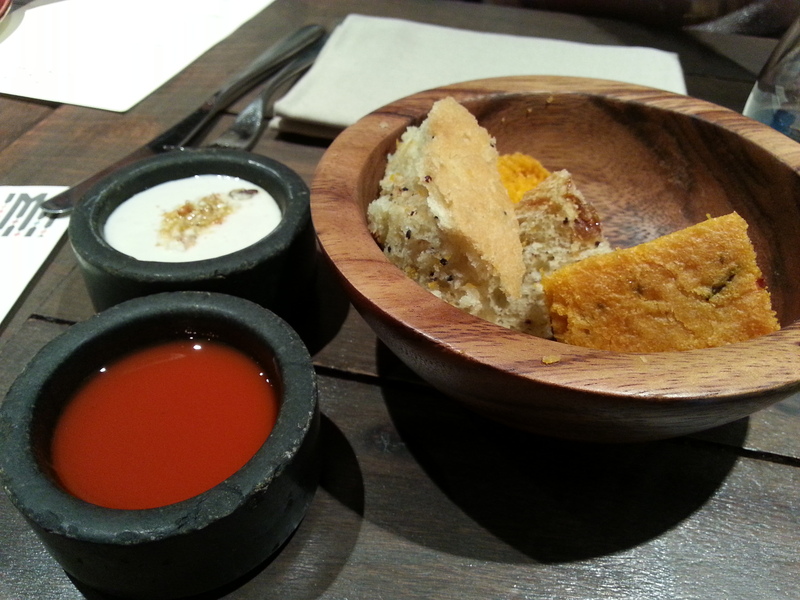 This is a delayed post but Lima is definitely a Gastronomy Society trip worth blogging about. As a Peruvian restaurant, their cuisine is one of the most unique due to the influences from the colonial era from Japan and the rest of Asia. When this is combined with their diverse geography of the Amazon rainforest, mountainous regions and the surrounding Pacific Ocean, this provides them with a rich selection of ingredients and flavours. The popularity of this cuisine is growing in London, demonstrated by Lima being the first Peruvian restaurant to be awarded a Michelin star, so this promised to be an exciting visit for us! Situated discretely near the famous foodie Charlotte Street, Lima was inviting as soon as we stepped in to be greeted by the friendly and accommodating staff. We were settled in the basement area for larger groups, so we missed out on the bright art display on the ground floor. However, it was cosy and the staff were patient as they explained the ingredients on the menu. They must do this for every customer since there was at least one ingredient for every dish that nobody had heard of – truly unique! We ordered from the set lunch, which was great value at £20/23 for 2/3 courses. Each table was given a continuous supply quinoa and corn bread before the dishes arrived, which were wonderfully dense, with small flecks of mysterious grains. The accompanying yoghurt-like dip was a unique combination, however, the red dip (I’m unsure what that was) was flavourless and did not add anything to the bread. When the starter arrived, it proved to be an exciting indication of what was to come. The presentation of the duck, beetroot, tamarind and cheese starter was wonderfully bright, especially with the dramatic pink beetroot reduction, and vivid green Amazonian nuts that garnished the plate. The duck itself was tender even though it was slightly too well done, and was complemented by the sweet tamarind sauce, which tasted very similar to the traditional hoisin duck sauce from Chinese restaurants. This highlights the Asian colonial influence on Peruvian cuisine. For the main course, I had the hot cod, black quinoa, potato with pepper sauce. The batter on the cod was light, crispy and not too oily, giving each bite-size piece a wonderful combination of textures with the soft well cooked fish inside. In my opinion, the black quinoa did not enhance the dish, but it was a unique ingredient to try, which had a chewy al-dente texture and grain taste. Did you know that there are more than 50 varieties of potatoes used in Peruvian cuisine? One of which was mashed and accompanied the fish. It was not too seasoned so the natural flavours were complemented with the pepper (another unique variety to Peru) sauce. For me, the highlight of the meal was the dessert. The earthy beetroot flavour from the emulsion was well balanced by the sweetness of the dulce leche. The ice cream was not overly sweet and the creamy texture was delightful! 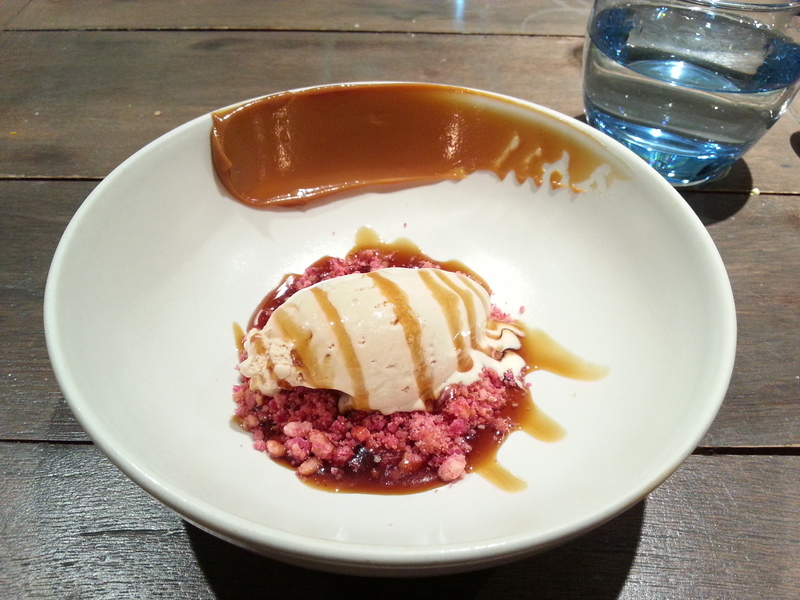 Paired with the crunchy crumble, this dessert was well balanced in terms of taste and texture. Overall, the great combination of unique flavours and ingredients makes Lima worthy of it’s Michelin star, and I would definitely go back to try the other unique dishes on the menu – especially the famous Peruvian ceviche!